2010 Fun Game of the Year: Red Dead Redemption (Xbox 360) – This was a last minute decision. For about ten months of 2010, I was convinced that Mass Effect 2 was going to be the best game of the year and the one I enjoyed playing the most. I’ll get into it in a moment, but if you’ve played it you know how good it was. Then I started hunting for treasure hunting in Red Dead Redemption and the competition was OVER. I really wished I had started playing this game sooner. I’ve been playing for the past few weeks with a grin on my face (and not just because I derive a sick pleasure from punching horses). Despite some story moments I didn’t care for, the over-arching story was enjoyable and compelling at times. But the most fun I was having was doing the stuff on the periphery — rooting bandits out of their strongholds, running down buggy thieves and flower picking. All of it thoroughly enjoyable and completely unrelated to the game at hand. But that doesn’t matter. When I finally figured out how to read my first treasure map and watched John Marston unearth the first treasure chest, that part of my brain that delivers pleasure fired like crazy. You couldn’t wipe the smile off my face and now I am doing nothing but hunting treasure until I’ve uncovered them all. It’s amazing that a simple game mechanic has elicited such a response. This is a FUN game. The funnest from 2010. Runner-up: Mass Effect 2 – ME2 was expansive, engrossing, overwhelming. It had great characters, a really enjoyable (but predictable) story and improved on most the issues I had with the first game. I really had fun playing through the loyalty missions and had some of my favorite gaming moments, especially the Legion storyline. The more I think about it, the more I want to go back and play it. I think that should count for something. 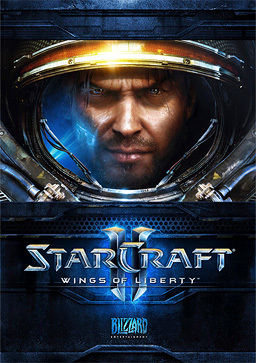 Without a doubt, of all the games I’ve played that came out in 2010, Starcraft 2 is the reigning champion. I actually started playing with my friends two 7hr. trial accounts and this of course made me want to actually BUY the game (Much to Blizzard’s plans I’d imagine). The game has all of the good from Starcraft 1 and is still adding/expanding/balancing the game in its new state. The new units are all unique and each race that you can choose (Protoss, Zerg, Terran) is just as viable as any other option when it comes to balance. The best thing I can say for SC2 is that it reminds me a lot of SC1 (better of course) and anything that reminds me of SC1 is an awesome game. Sure; things are not as perfect as the first but, they are working on it. Games are, in theory, supposed to be entertaining and fun. The plot, the physics, the character development, and story of Just Cause 2 are all completely atrocious. Yet this is the most fun I’ve had with a sandbox game in years. My favorite sandbox game is the kind they always have trouble making, a game where I can do my own thing without the game bothering me about it. You could follow the story and do all the missions, if you’re a boring person. If you’re an adventurous person you can roam about the island blowing up targets for cash, hijack fighter jets, and generally make a nuisance of yourself to the entire enemy army. I’ll admit, I was not initially sold on this game because I did not care for the original Just Cause. I even purchased this game with great trepidation, which was nonsense as it was easily the best bang for my buck I got all year. This game came out so early in the year that I almost forgot about when considering which game I had the most fun with this year. Bioware managed to improve on my favorite Western RPG series by dealing with the very few problems the original had (namely, its awful inventory system). They even introduced a feature that I now want every RPG to have – whenever you save, ME2 lets you keep playing, saving in the background instead of making you wait for it to finish the process. Aside from its technical improvements, I had so much fun with the series’ dark second chapter. Old friends return, new ones are made, and a seemingly unstoppable force threatens the galaxy. This game’s compelling gameplay and intricate story had my attention for the entire two weeks it took me to finish it. The DLC EA and Bioware has released through the year has brought me back each time. If you’ve forgotten your login/pw, you should be able to reset it there. Let me know if you need help!